We have recreation sites with grassy areas, great beaches, walking and biking trails, and play equipment for a fun family afternoon. Want to camp overnight? Our campgrounds offer both park-like settings and rustic, back-to-nature surroundings. We have several boat launches up and down the river where you can launch your watercraft for free. We also have two great centers for education - the Grant PUD Visitors Center and the Wanapum Heritage Center. Click here for printable recreation-site map. This area has a single-lane boat launch, ADA transfer platform, parking area, ADA paths/access, single vault toilet and informational kiosk. Sandy beaches are popular along the shoreline. Waterfowl hunting is a common fall and winter activity. **Please be Advised** During the week of April 15, railroad crews are planning maintenance work on the railroad crossing at Spanish Castle Road. Work is tentatively scheduled to occur on April 17, 2019. Be advised that while work is being conducted, access to Apricot Orchards Boat Launch will be unavailable. This area is managed in cooperation with WDFW. A small boat launch accesses the Priest Rapids Pool. There is an ADA hunting blind, two mile gravel trail, single vault toilet. Dispersed camping is limited to three consecutive days. Discover Pass is required. This is a dispersed recreation area. Shoreline fishing is popular. There is a day-use picnic shelter, an ADA fishing pier, walking path, interpretive signage and two vault toilets. Parking is limited. Non-motorized boating is allowed. The Crescent Bar Recreation Area features two boat launches one on Crescent Bar Island at Riverbend Park and one off the island at Chinook Park. There are also 55 reserved RV campsites, playground equipment, picnic shelters, a walking path and nine-hole golf course all open to the public. Make campsite or picnic shelter reservations and more by visiting the Crescent Bar Recreation Area page. See the multi-year transformation of the recreation site in this time-lapse video. This area is popular for beach goers and fishermen. Amenities include boat launch ramp, ADA boarding float, single vault toilet, picnic tables and one-mile trail. The Grant PUD Visitors Center is located near Wanapum Dam about seven miles south of Vantage off Highway 243. The center has many interactive features with free family fun and learning about how Grant PUD operates its dams on the Columbia River, as well as information about the region and its history. Free admission. Hours are M-F from 9 a.m. to 4 p.m (Oct. - April) and open 9 a.m. to 4 p.m. seven days a week (May - Sept.). For information or to arrange for a large-group visit, please call our Grant PUD Visitors Center number at (509) 793-1501. This picnic area has shaded tables and an irrigated lawn. The Wanapum Dam and fish bypass can be viewed from this location. This single-lane boat launch has an ADA accessible dock and vault toilets. It provides access to the Priest Rapids reservoir off of Huntzinger Road in Kittitas County. This popular, ADA accessible fishing site on the Wanapum Pool was used as a barge landing during the construction of Wanapum Dam. Parking is limited. 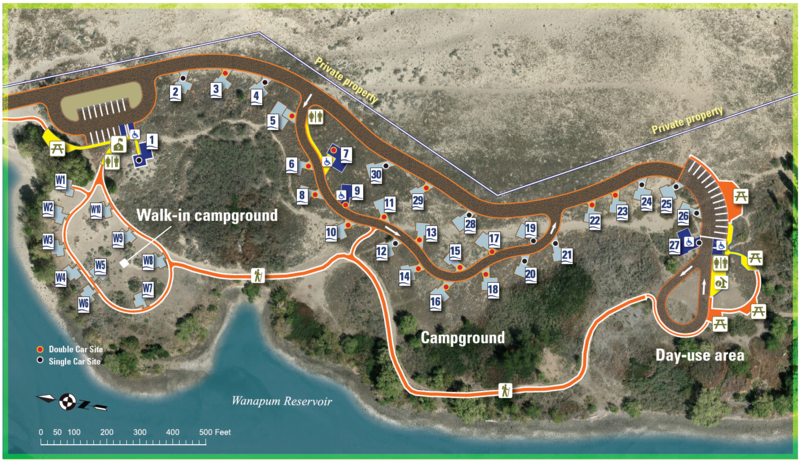 This popular site provides camping and fishing opportunities along the Columbia River with shoreline access, two single-vault toilets and 10 campsites accessible by vehicle (2 are ADA accessible). The campground is operated on a first-come, first-served basis with a nightly fee of $10. One-lane launch accesses Priest Rapids pool. Launch can accommodate small to medium recreational boats. Includes a campground, with 14 dry sites (no water/sewer/electricity), a 3-lane boat launch with docks, a 3.1 mile trail with great views of water front, a couple picnic areas with shelters and barbeques, a swimming beach, a fish cleaning table, interpretation and education signs, irrigated turf in the campground and one of the picnic areas and hand launch sites for paddle sports at both ends of the trail. Much of PRRA is ADA compliant including the boat launch and docks, swimming beach, restrooms, picnic areas and tables, hand launch sites, and the 3.1 mile trail. This site is located south of the Sunland Estates shoreline community. Amenities include: picnic area, parking area, double vault toilet, swim beach area with barrier protection, and interpretive display. This remote area has a short primitive trail and dispersed camping sites, available on a first-come, first-served basis. The site also has vault toilets and shoreline access. Parking is very limited. There is a nightly camping fee of $10. Includes a campground with 40 sites (tent only), trail, swimming area, sandy beaches, covered picnic areas with barbeques, interpretation and education signs, and ADA compliant campsites, picnic areas and tables, swim beach and restrooms. A large, shaded lawn area is available for day-use activities including BBQ grill and picnic tables. 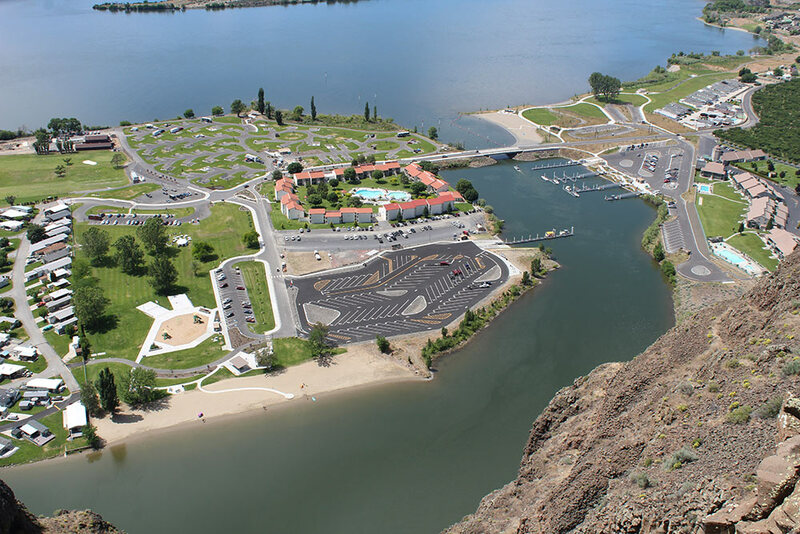 The Vantage Recreation area includes a popular boat launch located on the west side of the Columbia River, alongside Interstate-90. Amenities include: two-lane boat launch, ADA boarding float, picnic tables, restrooms and potable water. This scenic vista showcases views of the Wanapum Dam and Sentinel Gap. Information about the Ice Age Floods is on display at this site. This picnic area has shaded tables and an irrigated lawn. The Wanapum Dam and fish bypass can be viewed from this location. Recent upgrades included: additional picnic tables, interpretive signage/kiosks and trail, restroom, turbine interpretive elements, improvements to access road and parking area. Single-lane launch with ADA boarding float is located above Wanapum Dam. Launch was recently extended and can accommodate large recreational boats. The Wanapum Heritage Center offers a look at the culture and values of the Wanapum band of Native Americans of Priest Rapids. The center includes artifacts, displays, information and presentations depicting the heritage of the Wanapum. Admission is free. Hours are 8:30 a.m. to 4:30 p.m. on Monday through Friday and 9 a.m. to 5 p.m. on Saturday and Sunday. Safety is most important. Make sure you read and follow our safety rules and guidelines here. River levels can fluctuate without notice, exposing hazards and also leaving beached boats high and dry. Check river levels at our boat launches here. Make sure you are familiar with the park rules and restrictions for Grant PUD’s recreation sites. Interested in holding an event on Grant PUD property?